Jackie Bastianon was the Nature Conservancy of Canada’s (NCC’s) 2018 communications intern for the Alberta Region. 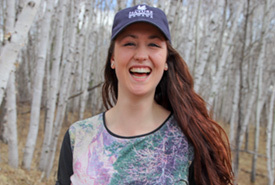 She is currently studying journalism at Carleton University in Ottawa and hopes to use her writing skills to inspire people to care about the environment as much as she does. During my summer at the Nature Conservancy of Canada (NCC), I was able to spend a few days a month outside of the office, out and about in the Edmonton area. Some of this time was spent at Conservation Volunteers (CV) events, but most days were spent at community events with my co-worker Rachel Garrett. Rachel worked out of the Edmonton office and was Alberta’s first-ever engagement intern. Rachel was tasked with doing outreach activities in the Edmonton area. The goal of this was to spread awareness about NCC in the communities in which NCC operates and to educate people about conservation. At the beginning of the summer, Rachel created a calendar of events by scouring the internet for events around the Edmonton area. I tagged along for many of the CV events she attended for the few months that we were both in the province. We got along well and I was happy to spend the hour-long drive from Edmonton to the town of Tofield, chatting about environmental issues. The outreach events we attended were often at markets. Several times we went to the Tofield market, where we set up a table inside the cozy community centre. We also went to the Callingwood farmers’ market, which was much larger and outdoors. Dressed in NCC attire, sitting next to the large pull-up banner of Bunchberry Meadows, and at a table covered with information and giveaways, we spent our hot summer afternoons chatting with curious passersby about NCC’s work, inviting people to attend CV events and trying to explain the many uses of the green NCC buff (a circular piece of fabric that acts like a scarf and 10 other things). What the events sometimes lacked in terms of number of attendees, they made up for in quality. The conversations that Rachel and I both had with people who stopped by our table were always meaningful. After they learned about NCC, these people would often inquire about events and initiatives happening in the community. I enjoyed watching people's faces light up at the mention of NCC’s Beaver Hills campaign. The Beaver Hills area is located east of Edmonton and contains multiple protected spaces, such as Elk Island National Park. At the mention of a place that people have been to and recognize, they immediately became more interested once they realized that NCC was working to protect important areas so close to home. Spending afternoons at the market talking to 15 to 20 people may at first glance not seem as effective as a large ad campaign, but that connection and face-to-face interaction is a powerful catalyst to inspire someone to care. There are many different ways to encourage people to care enough to volunteer or to donate, but after spending my summer talking to people it's clear to me that the power of community engagement is wildly underrated. To learn more about how to get involved with NCC, please visit natureconservancy.ca/en/where-we-work/alberta/get-involved/.